Microsoft released security updates, and non-security updates, for all supported versions of Microsoft Windows and other company products on the May 2017's Patch Day. Windows Vista support ended last month, and this is the first month without Windows Vista updates. Coincidentally, May 9th, 2017 is also the day that support for the Windows 10 RTM version ends. Microsoft switched to a new system in regards to information about product updates. The company did away with security bulletins last month, and things have gotten more complicated in the process as information are not presented as nicely anymore and take longer to go through. The guide begins with the executive summary, and lists all security, non-security, and security advisory patches and information afterwards. You also find information on how to download the updates, including direct downloads for cumulative updates for Windows 7, Windows 8.1 and Windows 10. Note: Some users report that they see the Internet Explorer patch KB3008923 again. This patch should not be installed. More info on this at Infoworld. No more Windows Vista patches. This is the last patch day for the Windows 10 RTM release. It won't be supported anymore after today. Updates were released for all supported client and server versions of Windows. Windows 10 version 1703: 22 vulnerabilities of which four are rated critical, and 16 important. Microsoft Office: varies depending on version. See KB4020152 for information. Addressed issue where, after installing security update KB4015551, applications that use msado15.dll stop working. Security updates to Microsoft Graphics Component, Windows COM, Windows Server, Windows Kernel, Internet Explorer, and Microsoft Windows DNS. KB4019216 -- Windows Server 2012 monthly rollup. Security updates to Internet Explorer, Microsoft Graphics Component, Windows COM, Microsoft ActiveX, Windows Server, Windows kernel, and Microsoft Windows DNS. All security updates for Microsoft products are available through Windows Update, various business update services and systems, on the Microsoft Download Center website, and also direct downloads provided on the Microsoft Update Catalog website. Most Windows systems have automatic updates enabled (as it is the default). This means that updates will be pushed to these systems automatically. Tap on the Windows-key on your computer keyboard, type Windows Update, and hit the Enter-key. Depending on the configuration, Windows Update will run checks for updates automatically, or when you click on the "check for updates" button. Updates are then offered for download, or downloaded automatically depending on system settings. I resolved the problem in IE11 by going to IE11 Tools (top right gear) and enabling Flash. https://www.adobe.com/software/flash/about/ . I resolved the problem in IE11 by going to IE11 Tools and enabling Flash. 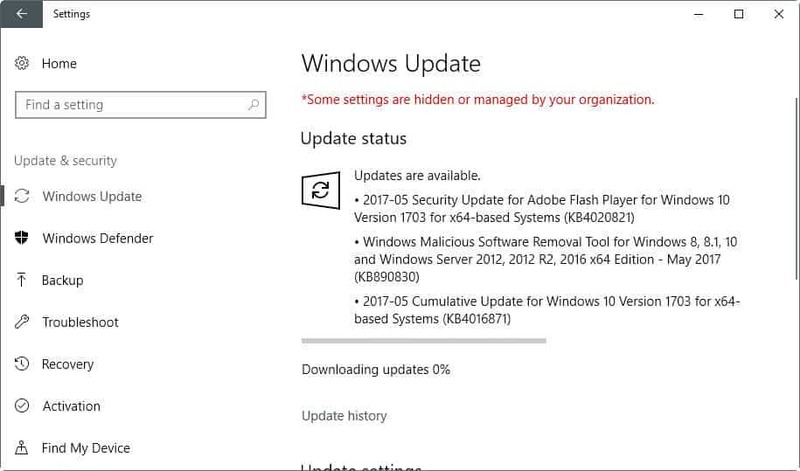 For what it’s worth, after updating Windows 10 CU on my Home x64 laptop today, KB 4020821 Flash, 4018483 Flash, and 890830 Software Removal Tool are not listed in this article, but do show in my Update History. I am not sure why this is so. to call a number to rectify this situation. I quickly hung up and did not write down the # to call. It’s not Microsoft. As evil as Microsoft is nowadays (and it is very evil), they have nothing to do with those scammers. I tried it briefly, it connects to MSN and it jumps up resource use. It also asks you to log in to your Microsoft Account. I cannot help wonder if it doesn’t spy on other things. One more good reason to ditch IE which I haven’t used for about 10 years now. On Windows 10 CU IE11 is essential to use along with Java if you want to successfully have fun playing with the Wordle site. To my knowledge no other current browser will work. No word on an update to fix their mistaken blocking of Carrizo CPUs or how their even going to update those clients now they’ve blocked them from downloading updates. Thanks once again for all the hard work Martin. I really appreciate all the work going into these systematic monthly overviews, they make life so much easier for many of us. P.S. No “Reply” button visible underneath your post. Thanks for the WordClouds tip. It works well in Chrome without Java, and can do some interesting things well. I’m still learning to use it effectively in conjunction with GIMP and IrfanView. Is there any easy way to install only security updates for Windows 7 that hasn’t been updated in while without getting all “install W10/telemetry etc. crap”….. I was wondering about this too. I haven’t been downloading any of the updates when they started to suspiciously bundle them all in one pack, and now I’m a bit confused which package contains what. It’s a portable program that doesn’t like long paths. I just put mine in the root of C:, thus: C:\WSUS. I stopped using Windows Update when Microsoft switched to rollups and a few months later I started using WSUS Offline Update. It seems to have worked pretty well for me so far. I believe it maintains its own blacklist of buggy or questionable patches, which might be why Belarc Advisor still shows me as missing a couple. (You can definitely add your own blacklist.) Regardless, I trust it more than I trust Windows Update. Anyone else have issues with Resource Monitor opening since the last two patches? I had not opened or used it since March so I had ran a few updates and this week and now I cannot get Resource Monitor to open (I am not getting a transparent box like others complained about in the past, it is just not opening at all). I tried to open in the Command line as well as from within the task manager. I click and it spins wheel of thinking for a second and then nothing happens. However, they don’t appear in in Windows Update which I have set to “Check for updates but let me choose whether to install them” and neither do they appear anywhere in Programs & Features. Does anyone know of a registry key to prevent that happening? Needless to say, I don’t like the idea of Microsoft deciding unilaterally what gets downloaded to my system. Anyone knows about issues with bitlocker? yeah those updates for may messed up with the power plan and the speed step of my intel cpu on server 2012 r2. i want some power saving plan + ThrottleStop 8.48 and the cpu was to the max no matter what. I installed the preview for june and it came back.